Color Team reviews are a smart way to measure your progress and ensure that reviews remain organized and effective — ultimately producing a higher-quality bid. They're a big investment, so their output should inform the proposal process to the maximum extent possible. To help keep your entire team committed to the investment and ensure that your color team reviews are successful, we've laid out some common review problems and how they can be avoided by leveraging an online proposal management and collaboration tool. writer has to go back to a reviewer to ask for clarification on a comment, they waste time they could be using to implement those revisions. The benefit of conducting traditional reviews in person is lost if you don't have adequate process and technical support to ensure that verbal comments are properly recorded and used to inform the next draft. When a team has to cull through a handful of documents, each with different track changes, to decide which comments to use, reject, and clarify, it can be incredibly time consuming and easy for comments get lost during the process. In short, lost comments equal more work. An online proposal management platform and collaborative software tool can automatically capture and save comments, allowing users to comment on a document in a systemized way. This catalogue of comments also helps ensure that all reviewers are aligned and up-to-date on previous reviewer comments, no matter their level of previous involvement in the process — so no efforts are needlessly duplicated. Another common problem with paper, or even traditional electronic document (like Microsoft Word) reviews is a lack of version control. With multiple reviewers and an unknown number of document versions circulating by email and print at one time, it can be challenging to keep track of everyone's comments and exceedingly difficult to maintain version control as new changes are made. The result? Lost input, risk to compliance and ultimately, a lower quality proposal. Collaborative tools automatically archive different document iterations, capturing changes from different users and review stages so they can be referenced if necessary. Using an online platform also means that your proposal document will "live" in one place, where everyone involved in its creation and review can see its current status and action items. Good collaborative tools support synchronous and asynchronous communication, allowing for continuous editing and review without losing control of the base document. The best tools hold only one "instance" of each work-product, so collaboration is easy and version control is never a problem. It's great to have an ample team of reviewers commenting on a proposal — but having too many document editors can cause confusion and make it easier for essential elements (content that directly answers an RFP requirement, for example) to be accidentally deleted. What's more, collecting comments from a handful of different editors through a variety of channels can egender the two pitfalls listed above — lost comments and lack of version control. Collaborative tools give the proposal manager control by allowing them to dictate user access, including limiting writers to particular sections so only designated personnel have the power to alter a document's content based on comments and input. Using an online proposal management platform can also help you save on costs. Hosting color team reviews on-site can quickly become expensive when you consider the travel, food and lodging expenses involved with bringing a review team together in the same space to collaborate — not to mention all those hours charged to B&P. With the advent of proposal management software platforms, teams can communicate and collaborate on a project without being in the same room — or even on the same timezone — and do it more seamlessly than the traditional BOGSAT ("bunch of guys sitting around a table") style reviews. Cloud-based systems allows all reviewers to easily pull up necessary information and reference different documents without printing out extra copies or re-typing the sections in question. Color Team Reviews are a smart investment in success — and collaborative tools make sure that investment is used to maximum effect. Among other benefits, online proposal management and collaborative tools can help solidify your process from start to finish, guiding all participants on their responsibilities, building confidences in the team and process and helping ensure that best practices are upheld at every step of the way. 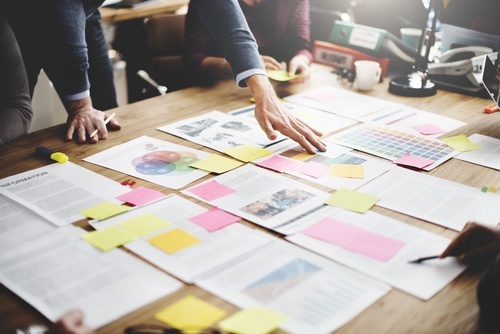 The days of sticky notes and wall walking may be coming to an end as a more seamless streamlined and effective proposal process can help your team deliver a higher quality proposal and improve your overall bid win rate.